This holiday we had a visitor, an old friend from my childhood. He and his family currently live in Michigan. While Florida presented them a welcome change of weather, they in turn gave me this frugal story of theirs to keep home heating bills under control. I was pondering this idea for last few days and ultimately asked for his suggestion. Having a reputation in our dorm for his legendary frugality, this friend of mine is the ultimate authority in cost cutting. Here are some of the techniques he suggests employing at your residence. When your thermostat is the one and only option to warm your home. Set it a few degrees lower than you normally do in winter. This will require less energy consumption to heat your home. 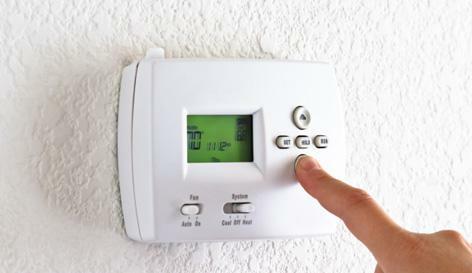 If you cannot turn off the heat while you are away, consider setting the thermostat even lower. This will help in lowering the heating bills as well as maintaining a suitable temperature in the house. Ensure energy is not leaking through the windows. Check and make sure the windows and doors are completely sealed and there’s no space under the doors. The windows should be sealed with caulk so that the chilly air can’t come in, while the warm environment is enjoyed inside the house. Although he didn’t do it, still he suggests considering replacing the regular windows with double-paned models which enhances warm temperatures in the house during the cool months of the year. Those windows that are treated with UV ray resistant film are perfect for ensuring warm temperatures. The importance of adequate wall insulation is often not thought of. Get it checked by experts; in case the walls lack proper insulation, the expert can advise you on the most economical way to improve them. Although most people do not realize the importance of insulating the walls and the cost of correcting wall insulation might become way more than the cost saves on energy bills, but within a few years cost is expected to be recovered. There’s no way you can make me believe that you need every part of your home heated up all the time. Do you use laundry room every hour? Do you need your bathrooms heated all the time? Heating unused rooms, attic or basements can consume a great deal of energy. You should consider blocking the vents that could are supplying heat to these rooms. Don’t make your entire house toasty. Even your bedroom vents can be turned off during day. The kitchen, when used will automatically become warmer. Consider leaving the oven door partially open when you are done with it (Not recommended if you have little kids at home), the dissipated heat can help warm kitchen and adjacent areas as well. During the night consider sleeping in the same room with your children. You can plan to heat only that room and save money by up by turning off vents in other parts of the house. You don’t have to be always in your t-shirt at home. Winter is the time to wear warm clothing, why not all the time? Wear sweaters or use blankets while watching TV or reading books. This is a small but effective way to keep yourself warm while trying to reduce energy consumption. Ensuring that the thermostat as well as the vents is in good working condition is very important. Equipment that is not in good working condition tends to consume a lot of energy in order to operate. Scheduled maintenance of the vents, fans and the thermostats is very important as when the dirt accumulates on their parts, they consume more energy to operate. He recommends cleaning every season. For us, we use the AC for cooling purpose only, here in south Florida we seldom need to turn the heat on. We get our AC equipment professionally cleaned every spring. Consider setting up regular maintenance on your AC/heat equipment on a yearly basis. Gas, Solar power, oil, space heaters and firewood provide excellent alternatives if used cautiously and prudently. In many states gas is the preferred option for heating purposes rather than electricity. Be it for cooking or for heating (room heater or water heater) gas is cheaper than electricity in most of part of this country. If you have to buy wood then this might be costlier than using electricity for heating. It might cost you more than $10 a night. But if you happen to live in a rural area or have access to free firewood, this would be the best option. Now a few cautions before you start setting a fire inside. Use fire only inside a properly operating fireplace and install carbon monoxide detector. Space heaters or window AC units are another consideration if you tend to spend most of your day in your office or kitchen, or the evenings in living room. Consider turning off the central heater altogether, or lower the thermostat drastically and use a space heater or a fireplace instead. In my childhood I remember my mother keeping buckets of water out in the sun from morning to make it warm by the time we came back from school in the afternoon. You can do it too, can’t you? On the other hand, if you can afford the upfront cost of a solar rooftop panel installation, your water would be heated for free for as long as you lived in that home! Open the window curtains, blinds during day light let the solar heat come inside. A few of the techniques I mentioned above might make you think that I am too frugal and am asking you to apply some insane techniques to save only a few bucks. Believe me; there are people in this country for which even saving $10 more per month is a big deal. You don’t have to follow each of these techniques, follow only what you think you can. Do what is best in your particular situation. I grew up in a foreign country, and in a home without AC. We employed all of the techniques I mentioned above. They are not insane and have been successfully implemented by human beings for millions of years. Do you have some other tricks up your sleeve, readers? Do share if you have. Sometimes you just do’t have a choice whatsoever when it comes to controlling heating costs. Where I live in particular, its impossible to make many changes, since the area determines whether or not you can choose your fuel source or are allowed to have a fireplace or even being able to put up solar panels (especially living in a condo most of those ate no-nos). Other than that I meticulously maintain my thermostat and change the time and temperature settings with the forecasts. This week, I said “screw it” and turned on the heat since, as you know, a cold front come through the region and it was in upper 50’s inside at night. A sweatshirt just wasn’t cutting it, and I don’t believe in layering at home, sacrificing the comfort of mobility for a few dollars. hope it was a little warmer down south! I am so familiar of this cold wave. As I said for some saving $10 a month isn’t big deal to take so much pain. But, for many saving this much amount is really a big deal and every small adjustment help. We have a thermal temperature device (typically around $40 or so) that I use to discover where leaks are around windows or doors. This has allowed me to take targeted action in specific areas to close up areas where you could (literally) be allowing money to escape right out the window. Thats very interesting to know MB! Thanks for sharing. I think its a great value for your money. In southern California, heating may not be a big expense, however A/C can be huge. I keep my thermostat in winter at 62 degrees when we are not home and when we sleep. We keep it at 68 degrees (winter) in the early evening while we are up. During the summer, we keep the thermostat at 78 degrees when no one is home. We keep it at 75 degrees when we get home until we can turn off the A/C. 99% of the time, we sleep without A/C because it cools off at night. My utility bill (electric & gas) roughly averages $70 per month year round for a 1,850 sq. ft. home. You are doing great KC, my 1400 sq ft also incurs a $70 per month bill. We are using a space heater now and I’m sure it is saving us quite a bit of money. The temp. inside is around high 60s so it’s not that bad here. Is baby RB40 happy with 60s? It’s 70 degrees here today! Our heat bill has been very minimal this winter so far. Usually there would be blizzards in January here. lets hope things stay as it is at your place. Nice solid techniques. Electric heating can be really expensive though so you should only heat small spaces with space heaters to save. We are a two persons family and usually whenever we need to turn on heater, its a space heater. This winter I had to use it for 2 days so far. Like Krantcents, living in SoCal has its benefits – like low heating costs. But the A/C during the summer months can be the killer! Though fans work great in the evenings. talk to me 🙂 living in SoFlo is exactly the same. But summer is hotter than yours. My wife always tells me to wear clothes. Warm clothes would just be a bonus. Thanks for the tips. Thanks for helping us how to save more and life happy, these tips are common we all read around internet but really impressive article you have posted here. Unfortunately, our condo builder used crappy windows that just barely meet the requirements. We compensate by turning off the heat when we are not home (ambient warmth from other units will keep it from falling below 15-16C), and turning it up only in the rooms that we actually use. I live in a condo and its only one thermostat, we can’t control individual rooms. Nice tips SB! I use weather strips which are very cheap but super effective in keeping out drafts. Drastically reduced our energy bills last winter. Another great tip is added in the comment above, readers! There are so many “little things” that one can do decrease both their energy consumption and cost of consumption. I wrote an article tracking our usage over 3 years and was able to reduce our average utility bill from $432 per month to around $130 p/m-was it anything major-no-just a lot of those “little things”. I will say though that for those that live in an energy deregulated state, they have the opportunity to choose a less expensive supplier as compared to the cost of the local utility, this can account for a big savings in some markets. Choosing a high quality air filter for your home and changing the air filter regularly is one of the best things you can do to conserve energy at home. The weather conditions in the US are unpredictable. Clogged air ducts can greatly diminish the quality of air within your home.